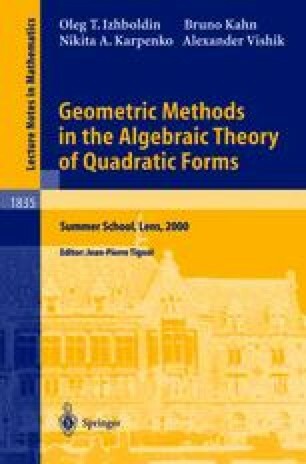 This text is the notes of my lectures at the mini-course “Méthodes géométriques en théorie des formes quadratiques” at the Université d’Artois, Lens, June 26-28, 2000. However, some extra material is added. I tried to make the material more accessible for the reader. So, complicated technical proofs are presented in a separate section. Applications are discussed in the last two sections. In particular, splitting patterns of quadratic forms of odd dimension ≤21 or of even dimension ≤12 are determined in the last section.